It can be tough when your company is small to medium size to meet all the standards and policy expectations of the Department of Contract Auditing Agency (DCAA), especially when it comes to the financial side of those expectations. 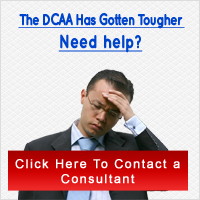 These costs can be staggering when you are having your first interaction with the demands of DCAA. One area of major concern is employee time keeping records; the government does its due diligence in making sure workers are paid according to federal laws and no fraud or waste is taking place. Thus, precautions of every type must be taken to protect the company and the public during DCAA timecard entry. For small or medium sized companies the old-fashion way of doing things in the area of employee time cards may seem reasonable. Everyone knows how and when to clock into work and everyone knows how and when to clock out. The human resource and payroll departments, if a company has such departments, know how to â€œreadâ€ the cards and they are comfortable with process. Besides, there have only been a few mistakes in the past â€“ no problem, right? Wrong, you need to be able to answer each question with accurate information when DCAA audits your paperwork and your company. The question you have to ask yourself is simple; can the way you are doing things allow access to accurate and complete information? The honest answer to that is, no. Manual time cards do not tell you how much work an employee is doing. Does it tell you employee work distribution? Does it supply immediate reports on the labor costs or a contract or create immediate reports on overtime spending? Can human error be prevented? Be honest, manual time cards fail to pull their weight in a world of now nor can they supply results that are compliant with DCAA standards. Since old-school time cards can never supply the immediate or thorough information that an automated system can, the investment may be worth it when trying to win a government contract. Automated systems supply easy access to reports and data that may be needed during a conversation with the contract manager. For example, job cost reports, insurances of DCAA compliance, labor distribution reports, automated human resources, or overtime reports for salaried employees. The ability to provide such data during the pre-award phase of a government contract will add to the pros that your company can provide. Thus, the cost of software that allows you to not only be prepared for audits, but to let you shine during an audit, can pay for itself within one contract. Therefore, the real question for any company to answer is not if they can survive using manual time cards, but if they can survive without an automated system.